The world's cheapest car has no air conditioning, no airbags, no radio and a whole list of other things, but people are still excited about it, at least in some parts of the world. They call it "the people's car"....gee that sounds familiar. For millions of people in the developing world, Tata Motor’s new $2,500 four-door subcompact — the world’s cheapest car — may yield a transportation revolution with as great an impact as Henry Ford’s Model T, which rolled off an assembly line one century ago. The potential impact of Tata’s Nano has given environmentalists nightmares, with visions of the tiny cars clogging India’s already-choked roads and collectively spewing millions of tons of carbon dioxide into the air. 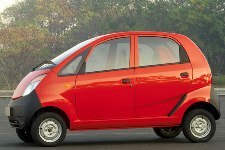 The Tata Nano most likely won't be available to consumers just yet, because it's missing several standard safety features.